The ASCO Series 185SE Residential Service Entrance Power Transfer Switch combines the series 185 automatic transfer switch with circuit breaker disconnect device for the normal source. An additional circuit breaker for the emergency source is optional. In addition, main jumper is provided to connect both the neutral and ground conductors in accordance with NEC requirements for service entrance equipment. 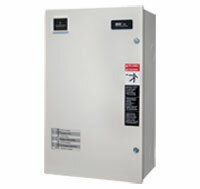 For use on Optional Standby Systems as defined by NFPA 70: National Electrical Code (NEC). Service entrance rated transfer switches are generally installed at locations that have a single utility feed and a single emergency power source. 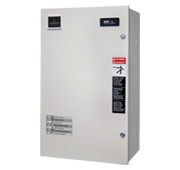 The ASCO Series 185SE Service Entrance Automatic Transfer Switch uses the same reliable transfer switching mechanism and controller as the Series 185 product platform, and also includes a circuit breaker as a utility source disconnect device. Suitable for use as service entrance equipment. The ASCO Series 185SE is listed to UL1008 for Transfer Switching Equipment, and meets all NEC requirements for service entrance equipment. Size rating available: 200 and 400 amps. Circuit Breaker disconnect on the normal source for isolation of transfer switch and other electrical equipment. Bonding jumper on Neutral and Ground. Silver plated copper ground and neutral bus. Solderless screw type terminals for External Power Connections. Available in either UL approved Type 1 or Type 3R enclosure.